If you’re looking for the best luxury afternoon teas in Paris, they’re to be found in the restaurants of the many 5-star hotels in the City of Light. Tea is becoming more popular in Paris these days and the options available for a distinctly French Teatime are rising higher than steam from the kettle. Whether it’s a typically all-sweet French occasion or a British-inspired afternoon tea with savouries, you’ll surely be tempted to book a table during your text trip to Paris. Today we’ll dive into the sumptuous French teatime at the Ritz, but stay tuned for coverage on three more exclusive teatimes at palace hotels in upcoming blog posts, each with their own particular specialties. 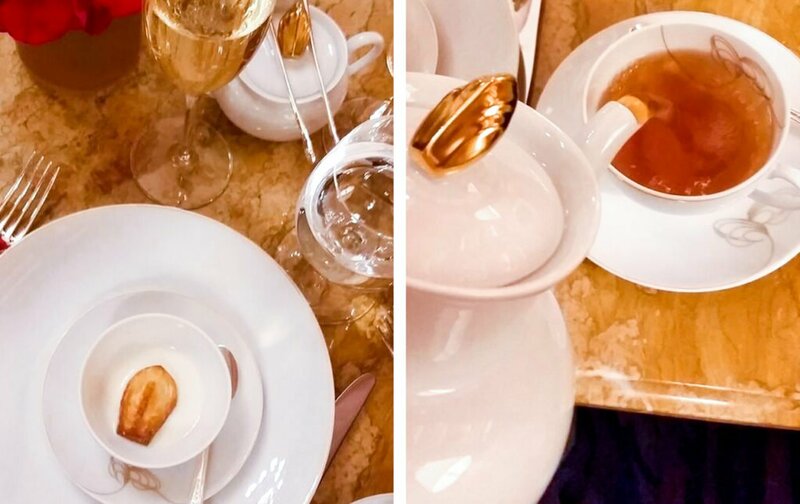 Teatime at the Ritz in Paris has been on my afternoon tea bucket list for the entirety of its four-year long renovation. 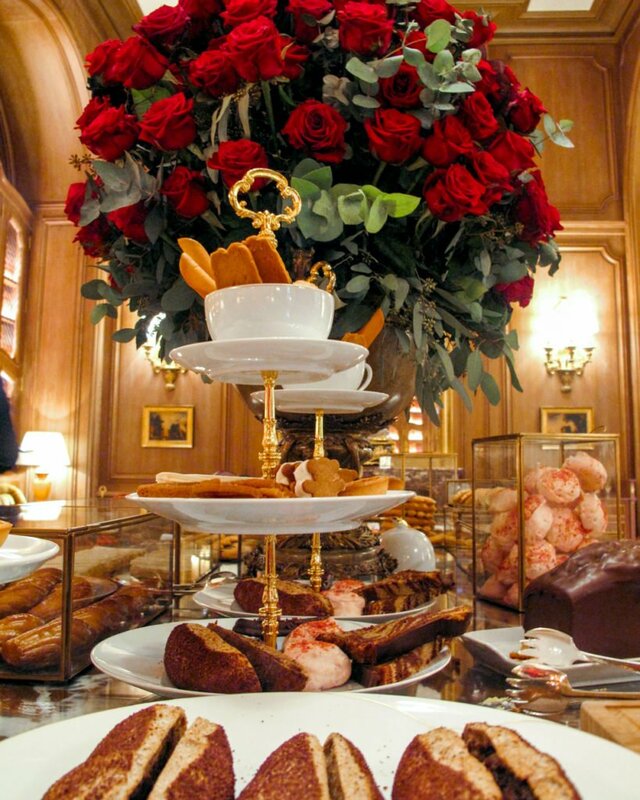 Even as the luxury hotel was undertaking its €200 million face-lift on Place Vendôme, I still featured the Ritz in my recipe book, Teatime in Paris, knowing that they would unveil something truly exceptional. 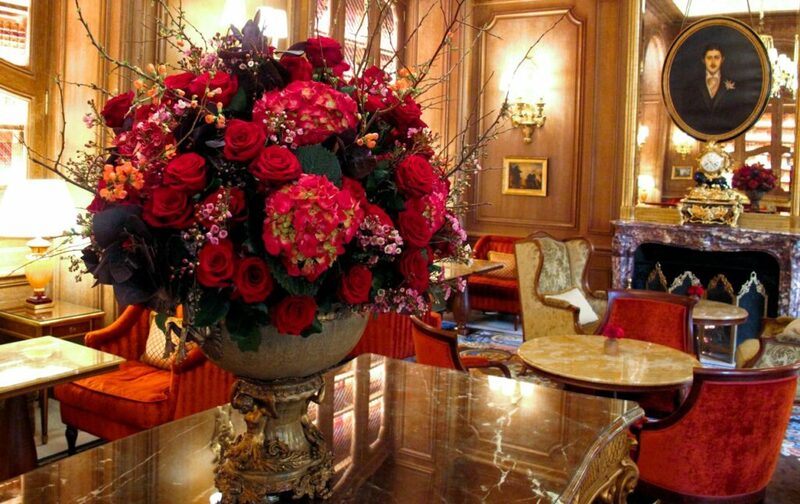 Bouncing up the lushly carpeted lobby, it’s not just the stunning red floral arrangements that delicately perfume the air; there’s also a hint of cedar-wood candles to set the ambience. 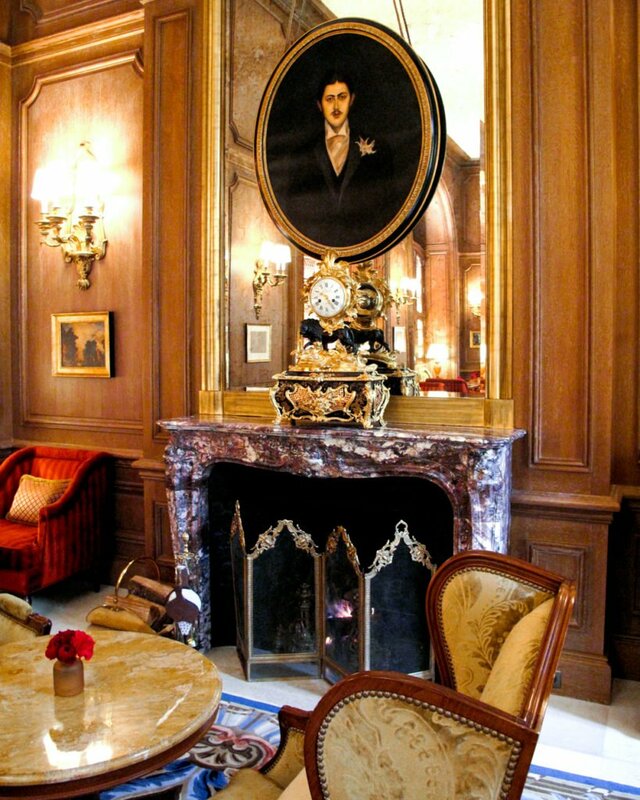 To the right, the cozy Salon Proust awaits casual-but-smart tea-timers ready to be seated into gold and red velveteen sofas or armchairs. 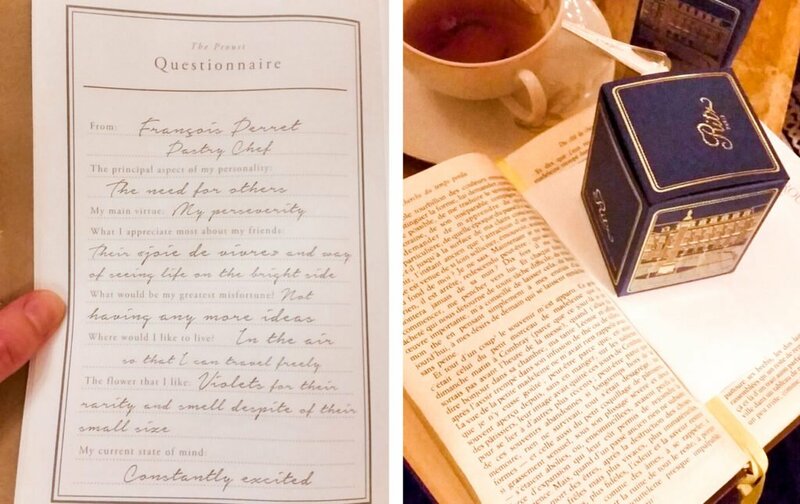 Immediately we’re transported to another époque, surrounded by wooden paneled walls bedecked with precious books and an oval portrait of Marcel Proust. He watches over us, sporting his favorite orchid in his lapel, looking toward his brand new Salon’s centerpiece: a marble table groaning from the weight of all his favorite childhood treats, concocted by head pastry chef, François Perret. 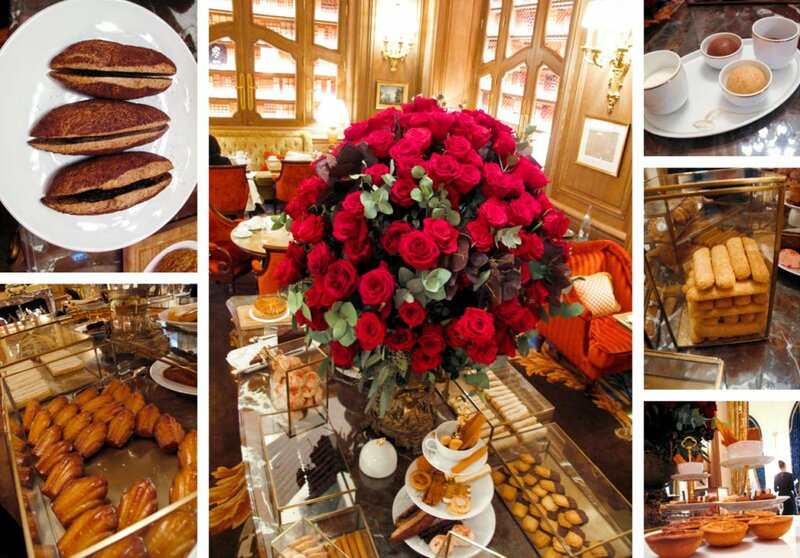 The Ritz teatime is distinctly French. There are no elaborate pâtisseries, but instead typically refined biscuits and petits fours from yesteryear, plus mini tarts and cakes. But it’s the scalloped madeleine teacake that takes center stage from start to finish, as made famous by Proust in his novel, “In Search of Lost Time” (À la Recherche du Temps Perdu). Even the tea service evokes a golden madeleine motif: Chef Perret helped to design the French white limoges porcelain, made by Haviland. Pages and pages are devoted to your choice of exceptional teas from the menu. The tea sommelier has picked out black, green and white teas, including semi-fermented and fermented teas as well as herbal infusions from TWG Teas in Singapore. I would recommend the Ritzy Earl Grey with added cornflowers. Non-tea-drinkers are also spoiled for choice with the likes of hot chocolate, five different coffees, as well as iced and cold drinks. Speaking of iced, a choice of Baron de Rothschild Reserve Brut or Rosé Champagne is a welcome accompaniment to add to the occasion. Service is immaculate and convivial, as each element of teatime is given a touch of relaxed ceremony. A mini madeleine arrives in a bowl for starters, then is sumptuously immersed in lemon-infused milk – we’re asked to leave it to infuse for a minute to enjoy the experience at its best. Three tiers of treats arrive, competing for center stage: we’re introduced to each layer in order, starting with a quirky teacup as top tier. They’re all biscuits and petits fours that would have traditionally been served in the brasseries of the time: sponge fingers with cocoa nibs, Russian cigarettes and Florentines. The second tier highlights biscuits such as Spritz, buttery Pailles au framboises (nothing like the ones from French supermarkets! ), airy allumettes of egg whites and lemon, and marshmallow bears. The bottom tier is devoted to tarts and cakes, with the lightest sugar tarts on a brioche base (I hear they’re now serving old-fashioned lemon tarts), pink praline meringue, marble cake and giant tuiles. A most memorable treat is perhaps the Pain au Chocolat. Not at all appearing like the classic viennoiserie that we see in Parisian bakeries, Chef Perret has played with the simple French childhood goûter (after-school 4pm snack) of a baguette sandwich filled with a couple of chocolate squares, cleverly transforming it into cocoa-nib-covered dark chocolate bread served with a platter of cocoa butter, coconut butter, whipped cream, and jam. The Madeleine du Ritz arrives hidden under a bell, lemon-glazed and delicately perfumed with orange blossom. So not to completely ruin your surprise, they’ve changed the flavour combination now. Don’t be fooled by all the light biscuits and mini cakes: it’s just not possible to finish everything that’s presented (well, without needing a golden crane option at the end to lift us out). A box of untouched goodies are yours to take home, plus yet another finale: the most exquisite tea box containing a Rooibos and yuzu tea with precise instructions to infuse 5g for 400ml at 90°C for 3-4 minutes, s’il vous plaît. PREVIOUS: The Best of Rue Saint Dominique – The Hottest Street in the 7th! NEXT: Fabulous Spring Break and Easter Savings with Paris Perfect! Posted on Tuesday, February 21st, 2017 at 10:59 pm in Food & Drink. You can follow any responses to this entry through the RSS 2.0 feed. You can leave a response, or trackback from your own site.